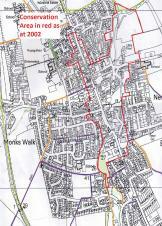 The Conservation Area in Buntingford stretches along the High Street from the Fire Station in the south to Vicarage Road in the north. Whilst it really covers only the buildings on the west side it does stretch up Baldock Road to Meeting House Lane and halfway along Norfolk Road. On the east, the boundary follows Pigs Nose before going further east and then northwards across the fields before returning along Wyddial Road to the Bridewell. Please visit the Clerk's Office to view the whole map.